The big purchase. 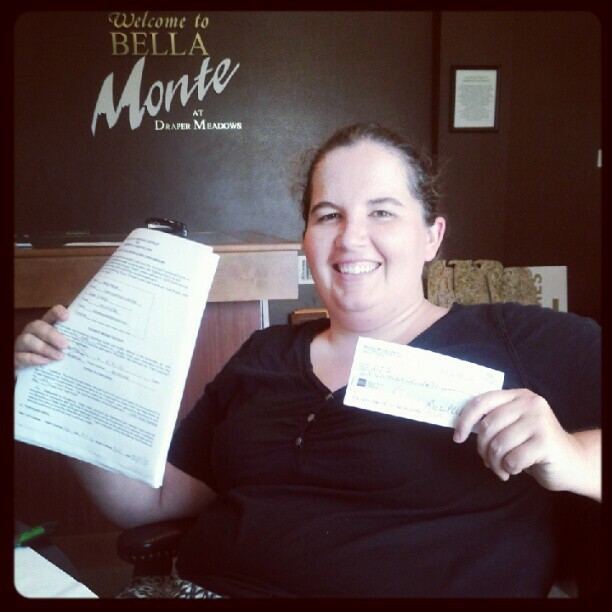 Earnest money paid! As everyone on facebook and twitter knows today I took the brave step and decided to sign a contract for a new build townhouse in Draper. I about had an anxiety attack before signing the papers but I knew deep down inside that it was the right decision. I had thought about it from nearly every angle and I think it will be a good move. For only a $100 plus more a month I will own a home as opposed to renting. It is viewable from where I currently live so no real transition there and will be much bigger. The key determining factor for me (aside from liking the layout and space) was that I looked at worst case scenarios and it still seemed like a good choice. If I were to say lose my job than I could get 2 roommates, 3 if I finish the basement and that could cover most if not all of my lease. Knowing it could work out even if things turned south really helped me make the decision. The condo I had offered on was smaller and does not have the roommate potential of the townhouse. The only real benefit of the condo is the kitchen was bigger but still the townhouse is a better choice. The resale value will be better than a condo and I can get most of the nice features of the condo. One thing I liked about the model home is that everything I liked seems to be included in the basic package. Things like granite countertops, wood laminate, upgraded carpet, 2 tone paint, large garage, soaking tub, etc are all included with the purchase. Other model homes I’ve been in everything seems an addition. I am surprised how quickly I made the decision but I had a limited time period to decide. In fact, they may have had another interested buyer this morning and it was the last lot left! Phew! But in reality I don’t think the decision takes that long. There is only so much data to look over and then the decision has to be made. Sitting and stewing over it only makes me more neurotic and anxious. Plus, its just the reservation so you have time to mull over little decisions like any upgrades or little financing decisions. In some ways building is perfect for me because it allows me to take each step in small doses and it gives me the house I want (or at least mostly want). Aside from approval process I don’t have to close on the loan right away, not until it is done (scheduled to be finished 12/31/2012. Should be my biggest Christmas gift ever!). Today I feel proud of myself. I am officially a grown up (only took me 31 years!). I’m a super independent person but for some reason I never thought I would buy a house by myself. It just seems so big for one person but I’m doing it! Hurray! It just makes me feel like I can do anything if I can do something this big. I’m actually excited for the next part of the process, picking finishes, and watching it get built. How fun! If anyone wants to see the model I’d love to show it to you. Thanks to all my friends for your love and support during this fairly anxious process. One nice thing is the mortgage broker I was working with, referred to me by my uncle Tom, works for the same company as the builder’s broker. That saves me applying to 2 brokers (I’ve already applied for 2 others, so 3 total and I think I have the best rates). They will have my preapproval to the builder by Monday. One less thing to worry about! So there it is. I am a homeowner in training. Should be a fun 6 months! Now on to my open water swim. What a week!